A Digimon that was transformed into a half-beast, half-man form when Agnimon lost its power. It is missing the "Combat Instinct" that Digimon naturally possess, and moreover, it has lost power. However, it is a being that has inherited a Spirit of the legendary Ten Warriors who possess ultimate strength, so although it has lost power, ordinary Adult-class Digimon aren't a match for it. 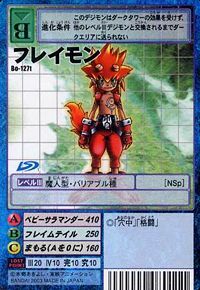 If anything, it has kindness inappropriate for a Digimon and is similar to an Adult Digimon, counterbalancing its mischievous part. Its Special Move is firing off an aura of flames (Baby Salamander). The form Agnimon takes on when it has lost its power. It is quite strong, having inherited the power of the legendary Warrior Ten. However, because it is afraid of fighting, it has no will to do so. Title: 「炎童」 — "Flame Kid"
Anime/Manga Digimon Frontier: "My Home! 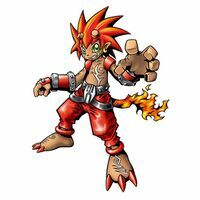 Takuya's Lonely Return"
ベビーサラマンダー Bebī Saramandā Monkey Ball Attacks with its flame aura. Attacks foe with flaming tail. Flips through air covered in fire. 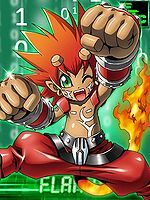 Takuya reverts to this form when he is returned to the Real World on the Trailmon of Darkness. Flamon is a playable character. 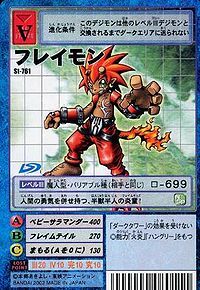 Flamon is only obtainable as a collectable card. Its card is part of the Agnimon Evolution (アグニモン進化 Agunimon Shinka) set. 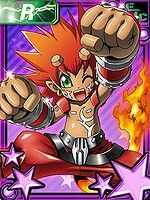 Flamon is available as a Digimon Medal. Flamon is only obtainable as a collectable card. 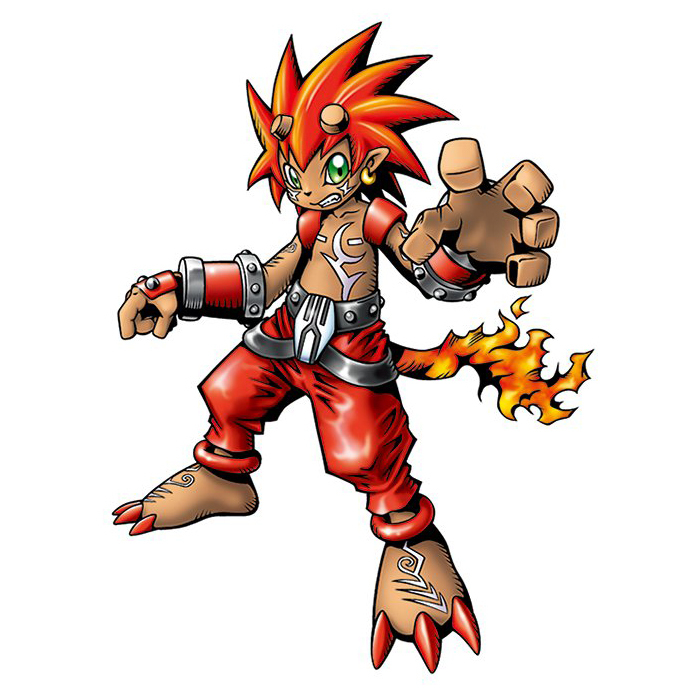 This half-beast, half-human Flame Kid possesses the courage of a human! The form of Agnimon who has lost its power, it lacks battle instinct but instead has kindness. 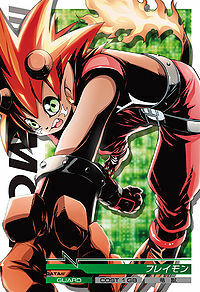 Its power surpasses ordinary Digimon, due to having inherited the Spirit from the Warrior Ten. ↑ Digimon Frontier: "My Home! Takuya's Lonely Return"
This page was last modified on 28 March 2019, at 06:36.